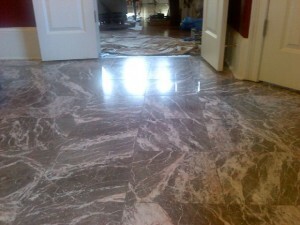 Howdy Folks – just a quick post to show that not all marble floors can be restored in the same fashion. Depending on the damage – is it acid etch damage or more scratch related? 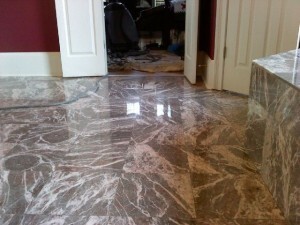 When the marble is dull due to scratch damage the only proper way of restoration is through the use of diamond pads. The height of the tiles in relation to one another can also affect the plan on restoration as well, but that is something that will need to be determined by a site visit. This particular floor is a Fiore De Pesco marble and is quite popular with its gray and pink coloring. Our plan was three different diamond grits to remove the scratch and acid etch damage followed with a powder polish. After that we steam cleaned the grout and gave it a final buff. Just another beautiful floor!! !